Florida is an extremely popular destination for Villaseek customers, and for good reason; the “sunshine state” is a family holiday dream! Orlando in particular is one of the entertainment capitals of the world, with enough theme parks, shopping malls, golf courses, restaurants and nightlife venues to keep you occupied for the duration of your holiday. We’re delighted to present one of our newest additions to the villa listings, this beautiful villa ideally situated in a very peaceful location at Hampton Lakes, Orlando. One of the most sought after villas in the area, this is a luxury, detached, two-storey home surrounded by orange groves making it totally private and not overlooked. 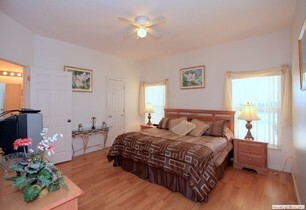 It comfortably sleeps 11 and has all the amenities you would expect and more. There is an outdoor bar and summer kitchen with electric grill perfect for BBQs. The spacious 50ft x 25ft decking area leads to a stunning pool and Jacuzzi. If you can tear yourself away from the outside space, the high spec living room with 56″ home cinema TV system, free calls and wifi will be sure to keep you entertained. Only 11 miles from Disney World Florida and close to all the other major attractions, such as Sea World Orlando, Busch Gardens Orlando, Universal Studios and Discovery Cove. At prices starting from £575, you can’t go wrong! 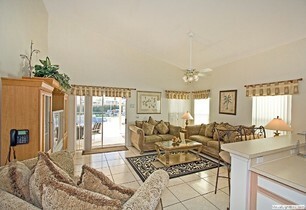 For more information on Florida, click on our guide or search for more villas on the main site. More Harry Potter in Florida! Universal Orlando Resort and Warner Bros. Entertainment have announced a new The Wizarding World of Harry Potter-Diagon Alley “environment”. The new area will be built across both theme parks by next year, and aims to bring to life some of the places in the Harry Potter books and films. Universal already offers visitors a Hogwarts and Hogsmeade experience at its Islands of Adventure theme park, but now Diagon Alley and ‘London’ will be located within the Universal studios Florida theme park. Just like in the books and films, visitors will be able to travel between the two on the Hogwarts Express. “Our vision is to create two amazing theme park experiences that combine into one, complete, magical journey,” said Universal Orlando Resort EVP of marketing and sales Alice Norsworthy. 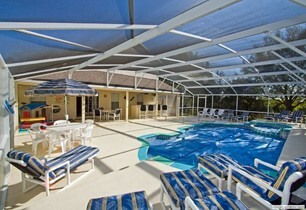 We have plenty of accommodation in the sunshine state of Florida, many which are an easy distance from the theme parks. Why not try one of these 3, 4, 5 & 6 Bedroom Holiday Homes and Resort Town Homes with private pools, spa, hot tubs, game rooms and home theatres. Also, don’t forget to check out our recent Florida guide. There’s a new reason for visiting Florida, especially if you have young Harry Potter fans in tow. Universal’s Islands of Adventure theme park in Orlando has just opened its newest, grandest and most ambitious addition: The Wizarding World of Harry Potter. The Wizarding World is full of sights from the Potter universe. Rides including Dragon Challenge, Flight of the Hippogriff and the Forbidden Journey promise to bring thrills to guests of all ages, while sights like Ollivander’s Wand Shop, Hagrid’s Hut and Filch’s Emporium of Confiscated Goods will delight Potter fans. If that list of whimsical flights of fancy leaves you cold, flight search website Skyscanner is trying to drum up business with a list of alternative wizard venues. Starting with New Zealand, used as the setting when JRR Tolkien’s Lord of the Rings trilogy was filmed. With unrivalled vistas and great natural beauty, it’s the perfect setting for the wizard Gandalf to bestride Middle Earth. Tolkien fans continue to catch flights to New Zealand to experience the world of hobbits, elves and orcs for themselves. Orcs no good? Then there’s always the Wizard of Oz, in Kansas, USA. In 1900, L. Frank Baum described the adventures of one Dorothy Gale, a young girl who is whisked away by a tornado, ending up in the Land of Oz. Befriending a talking scarecrow, a cowardly lion and a tin man, she journeyed to visit The Wonderful Wizard of Oz and get back home to Kansas, where today fans can visit the Oz Museum which holds masses of memorabilia from the books, films and musicals. Possibly even more magical, if you’re a basketball fan, would be a visit to the Washington Wizards in Washington, DC. Based in the capital city’s Verizon Center, this professional basketball team had a genuine wizard of the court play for them in the form of superstar Michael Jordan from 2001 to 2003. They still fill their arena for every game and their skill and showmanship make for an unforgettable experience. Or so they say. Closer to home is Parc Asterix, a theme-park 22 miles north of Paris that’s based on the world of cartoon character Asterix. There you can meet the wizard, a member of Goscinny and Uderzo’s tribe of rebellious Gaul warriors who comically torment Julius Caesar’s legions in ancient France. Getafix is a potion-concocting druid who can prepare an elixir that grants superhuman strength to those who drink it. Are Florida price cutters ruining the rental market? “The rates were, to put it bluntly, scandalously low. This is the mindset of villa owners who think that ‘anything is better than nothing’ but that sort of marketing encourages haggling and bargaining, and pushes prices even further down. For a 4 bedroom, 2 bathroom villa in Esprit, Davenport, this owner charges from £599 to £750 per week. Is he correct in believing it’s better to leave the villa empty than offer a last minute price of, say, £300 per week? And is his belief that people looking for a bargain are less likely to respect the house well founded? Rental prices in Florida have been tending to fall because so much property is on offer and visitor numbers have been dropping. Is this a trend that can be successfully resisted? 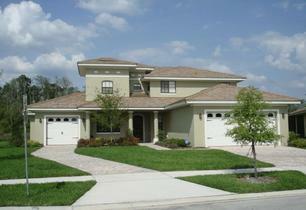 Highlands Reserve – immaculate 5/3.5 villa with sunny pool. Outstanding rental history. $291,000. That’s around £180,000 – say £200,000 with taxes, charges and set-up costs. So if you were to rent that out at £395 a week (the sort of ‘scandalously low’ figure our emailer has in mind) you would need to sell 31 weeks a year to bring in £12,000. In reality, you would charge more for the summer holidays and Christmas. Would £12k be enough to pay mortgage, management costs, cleaning, local taxes, maintenance, insurance and all the rest of it? And would you be better off selling, say, 20 weeks at £595 to bring in the same sort of money? And why is it that the spread between minimum and peak weekly prices is much less in Florida (where the peak price is usually no more than 50 per cent higher than the minimum) than, say, Spain where the top rate is often three times or more? Let us know your views in the comments section below – whether you are a holidaymaker thinking of renting a Florida property, an owner trying to make a success of renting, or maybe a professional involved in the business.